I was expecting a big presentation, town-hall style with people sitting down and some asking questions in front of everybody, but instead it was more like a poster session. I guess this way it doesn’t give a podium to critics, and you can show up a bit late no problem. When I got there, they asked me whether I’m with the media. With uncertainty I said that sometimes write about transit, so I was put in front of Virginie Cousineau, who I later found it is the directrice affaires publiques. I wonder whether they’d done the same if I had said that I write a blog; although they were all very open and friendly. I had so many questions I didn’t know where to start. So I tried something simple, I asked Ms Cousineau about the Deux-Montagnes line, whether any stations will be removed if they are not considered profitable. She assures me all the stations will remain, and they will remain in the same location. That’s a relief, I guess, especially for those living along those barely used stations. I ask her whether the Deux-Montagnes line will shut down during the complete overhaul. She says it won’t, or at most it will shut down for “one or two weekends”. That seems strangely optimistic, given they have to build an automated line with a completely new signalling system, build a whole new set of stations, probably reconfigure gare centrale, remove 15 or so grade separations, hook up to the new branches, etc. On the topic of grade separations, I ask her how that’s going to work, replacing them all while operating the line, isn’t that expensive? She says the CDPQInfra is consulting with the municipalities along the line to figure out these issues. I also ask whether there’s any details about how they arrived at the 5.5 billion construction cost figure, she says nothing public. At this point we get interrupted by a concerned/angry citizen, who engages in a long rant rather than asking questions, I think he wants to vent. I move on. I come across Sylvain Ouellet, whom I had previously met. He has a large set of concerns with the project that echo mine, about capacity, hurting transit in the rest of the island, fare integration, financing, and safety. He was the one who raised the fire hazard issue when the AMT start running diesel/electric dual mode trains through the tunnel. Undoubtedly he’s also concerned that the REM project is shifting government priorities away from the Blue Line extension, which is now stalled. 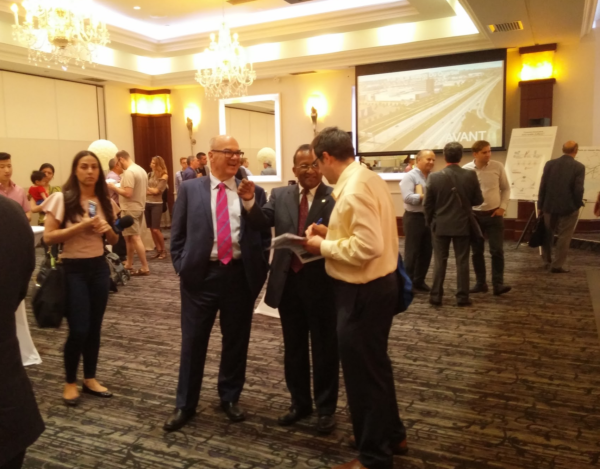 Mr Ouellet shared some of the concerns I had about capacity, and found the CDPQInfra people had unsatisfactory answers to his capacity questions. We discussed the existing commuter rail system, and he mentions there’s a danger that the other commuter rail lines will shut down. He thinks the Candiac line will be toast because people will prefer driving to the Dix30 terminus, rather than stick with their four rush hour trains. Then the Vaudreuil-Hudson line will get all this competition from the West Island branch of the REM, so that may get shut down. After all, that line is expensive to operate. 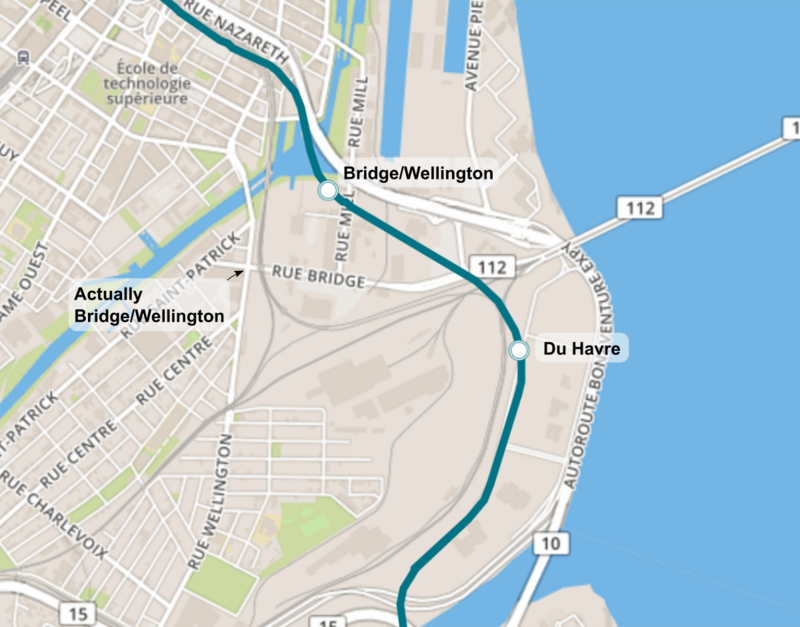 Once those two lines are gone, the St-Jerome line will be the only train going to Lucien L’Allier, which may not be worth it, and it may get cut to terminate at some other station. Will the Candiac Line (dotted grey), Vaudreuil-Hudson Line (dotted pink) shut down, and the St-Jerome Line (dotted green) get shortened? 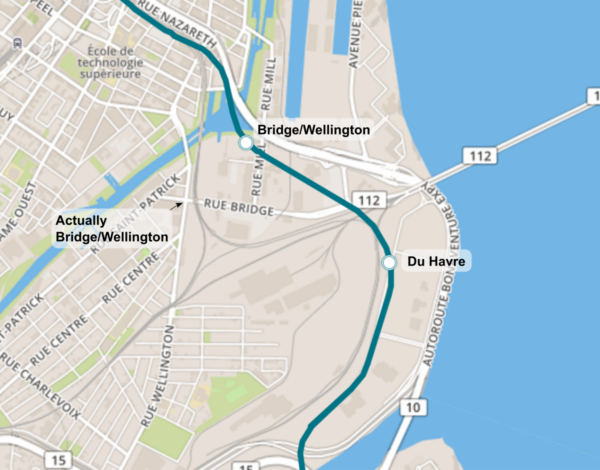 The CDPQInfra has some laptops set up, with a scrollable map of the REM proposal, where we were finally able to see the exact location of the Bridge/Wellington ‘potential’ stop. Their original marketing material seemed to indicate that the stop was actually several hundred meters away from that intersection, in the direction of nowhere, joining the adjacent stop of Du Havre in being nowhere. Turns out, the stations really are in the middle of nowhere. One group of people I recognize as related to the Greenspace Coalition, Sierra Club of Quebec, les Amis de Meadowbrook and coalition Sauvons l’Anse-à-l’Orme — groups that want to protected Montreal’s very sparse green spaces. 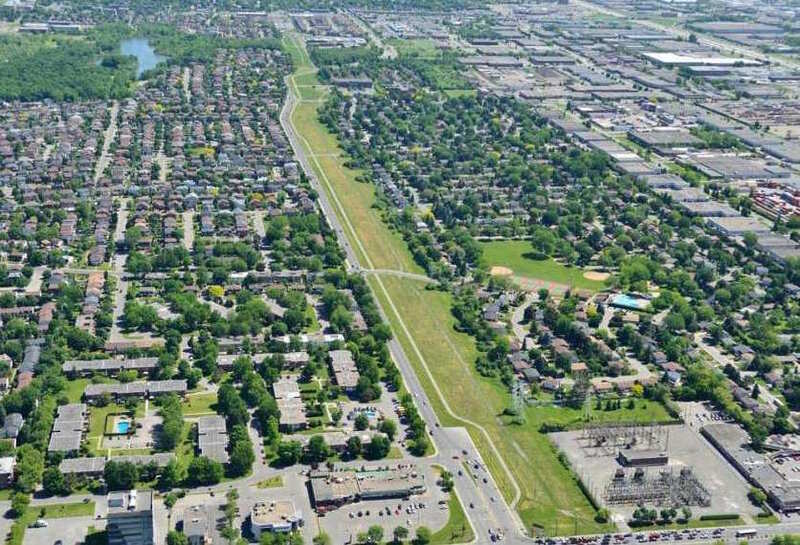 They’re very concerned that the Sainte-Anne-de-Bellevue station is far from existing populations, so it require parking spaces, which will destroy nearby green space and it will give more ammunition to developers and the central city to destroy l’Anse-à-l’Orme, a conservation zone in Pierrefonds, just a few kilometers North. While I’m poring over the REM maps, a woman sits down next to me at another laptop, studying the map with interest. I ask her what she thinks about the project. She turns out to be the chef of the Vrai Changement party (remember Mélanie Joly?). Justine McIntyre is also the Counsellor of Bois-de-Liesse, that’s the part of Roxboro that includes the Roxboro and Sunnybrook station along the Deux Montagnes line that the REM will replace. She takes the train every day. She seems largely concerned about the A-13 highway station, wondering why they’d put a stop near a green space that she’d like to see protected. 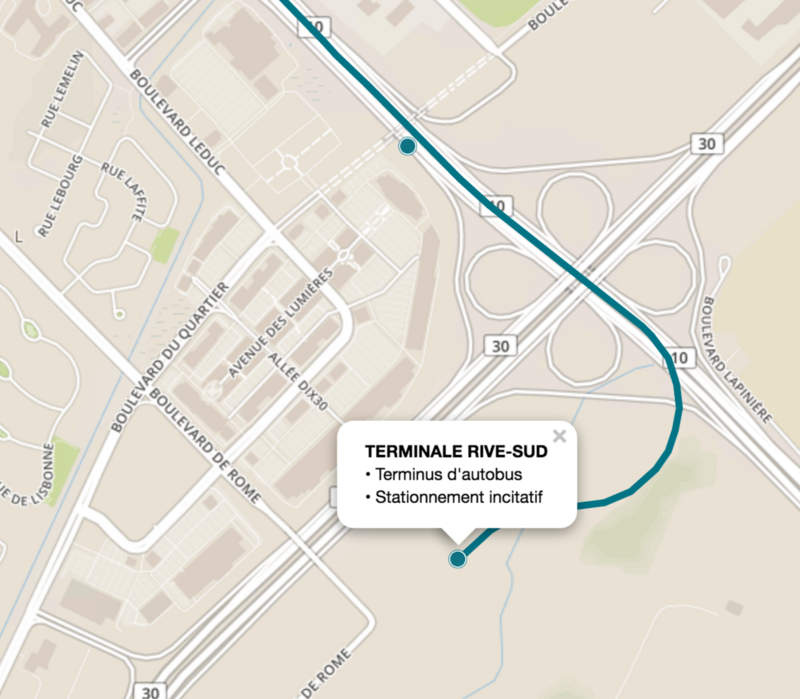 I surmise it’s because they want to put a parking lot there, to bring in people from Laval along the highway; this station has been on AMT maps for a while. She’s really not so happy about that, would prefer if people didn’t drive into her district to park’n’ride. I mention I personally don’t like the park’n’ride either, I’d much prefer if a station connects to people and bus corridors, like it would be possible on Boulevard Toupin, a couple of kilometers to the East. She thinks that’s a great idea, and she’d prefer that as well. One of my concerns is that the whole project is way too highway centric, and all the confirmed new stations will be on or along highways, except for the airport stop. Given that I’m talking to somebody who works for Roxboro, I figure I’d ask her what she thinks about my crazy idea to run the transit line two kilometers north, along the Hydro Quebec overhead line corridor. Eastward view of the Hydro-Quebec corridor, 2km North of the highway and proposed REM, which are on the far right of the image. Running a train there would bring it much closer to people in the north of the Island, many people would be within walking distance of the stations, and the North-South boulevards on the West Island would be much better connected, allowing densification there. I expect her to dismiss the idea outright, but she actually thinks it could maybe work. She currently works on a project to densify the northern portion of St-Jean Boulevard, hoping to creating a more urban density node where people could live and work, and walk, and understands the importance of trying to densify certain areas in the suburbs. She has to catch her Deux-Montagnes train home soon. It runs only every hour. I suggest that even without rebuilding the whole line, it would be possible to run the train every 15 minutes with only relatively minor upgrades. For example, at 15 minute frequencies, one may not have to remove all the grade separations. On that note, I ask her whether the CDPQInfra has consulted with her about the grade crossings, like they claimed. Ms McIntyre hasn’t been consulted on anything. She doesn’t quite believe me when I mention that there are fifteen grade crossings on the line, so we end up going through the line on Google Maps, one by one, and count 13 crossings. Every crossing may cost tens of millions to remove, so that’s quite an expensive project. After Justine McIntyre left Alan De Sousa sits down next to me on the other side. He’s actually the only person I recognize here without having met him before. Alan De Sousa is a friendly guy, and he’s really excited about the REM project. He has the aura of a winner around him. 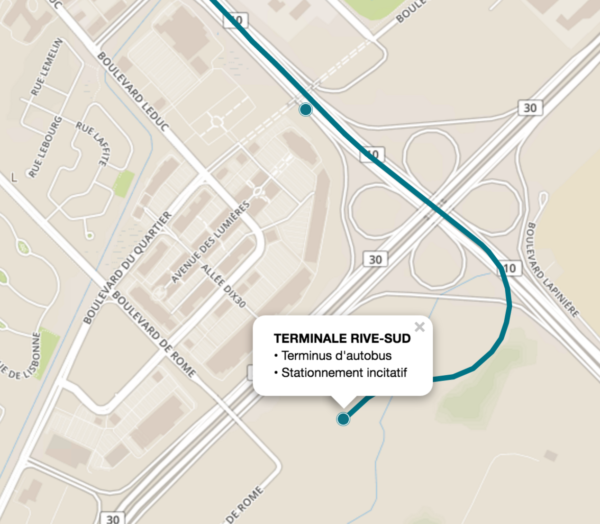 Ville Saint-Laurent is along the trunk of the line, so his district will get direct connections to the airport, the West Island and Brossard, and very frequent service to boot. He claims he actually proposed the routing to the Aéroports de Montreal people himself, to try to get them to access the airport 5km from the north, rather than connecting via existing lines a few hundred meters south of the airport. 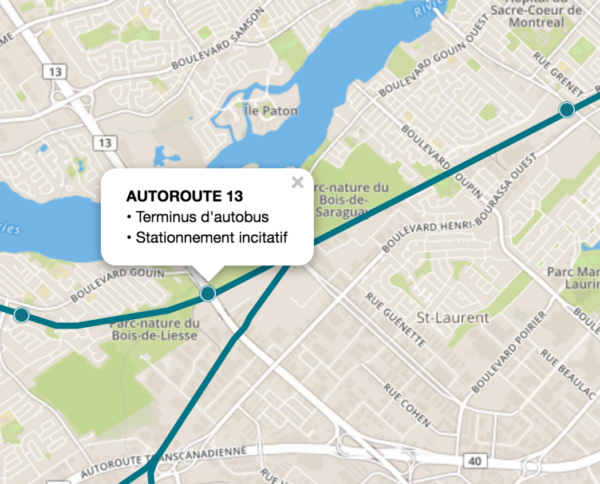 He doesn’t really seem to mind that the only new stations in his area are in a suburban office park (Technopark St-Laurent), at a parking lot to a highway (A-13) and at another highway (A-40), for riders to transfer from the Mascouche line that will be cut. Instead, he points out all the great stations we’re going to get, which are basically the ones that already exist today. He goes through them one by one, pointing out connections to the other transit lines, and what’s nearby. At du Ruisseau he points to the highway north of the station, and how it will be a great connection for people driving in from Laval. I disapprove, great, more parking. Undeterred, he insists that the du Ruisseau station parking lot is not full; he’s certain about it, it’s his district. ‘Go look it up,’ he urges. (I looked it up, the parking utilization is “only” 84%). What about consultations between the Caisse and the city? He indicates there hasn’t really been any yet. On capacity issues, he says ‘well just extend the orange line to Bois Francs, and that’ll empty the trains there’. I ask him who will get off, given that people want to go downtown. He says that there are 400,000 workers downtown, but there are 350,000 workers in Saint Laurent, and they’d use the REM. I try to explain that the capacity issues are due to existing riders who go downtown, they won’t be emptying the trains at Bois Franc, because they want to go downtown. I am not successful, I think that argument is a bit too complicated for this setting. Maybe he also hopes that the capacity issues will force the Orange Line extension to Bois-Franc, which would be another great project for his district. He suggests I talk to the CDPQInfra people about these of issues. Still poking, I mention that the project seems really expensive, 5.5 billion for 150K riders, of which 30K are using the Deux-Montagnes train today. What about the Blue Line Extension, which would bring in 80K people for 3 billion? The Blue Line! He says it keeps getting more expensive, now it’s at 3.9 billion (I couldn’t find that figure). He says originally it was supposed to be around 2 billion (or something along those lines), then 3 now 3.9, tomorrow it’s gonna be 4.5, then 10. He’s basically saying the cost will keep rising and it will never get built. Ok, so de Sousa doesn’t like the Blue Line extension, fair enough. But what about fares? Are they going to charge STM fares, is it going to be integrated? He says they just passed a law, all the fares in the AMT are going to be integrated now. So does that mean we’ll pay the STM fares when travelling within the city. He doesn’t know what the fares will be, but they will be integrated. I point out that right now you could get a AMT zone 2 ticket and ride the STM and AMT trains. He repeats but now there’s a law, and the fares will be integrated. So does that mean that it will cost the same amount of money to take the bus as the train when travelling from the same location? He doesn’t know. I give up. I figure that maybe there are some people from the Caisse here who are the experts and can answer some questions. Looking for some experts, I come across Lious Trudel, who turns out to be the directeur immobilier for the CDPQInfra. He used to work for CN, just like Michael Sabia, the President of the Caisse. Trudel is standing standing next to the guy who’s responsible for the environmental concerns, so I’m jokingly asking who’s getting more flak these days. So far it’s still the other guy, those green space people are really on top of their stuff. The first thing I ask Mr Trudel is about the Historical Buildings, there was a threat to the New City Gas and the Rodier Building. He says, oh, they found a way to not touch New City Gas, so it will be protected. I ask about the Rodier building, he says that building may yet have to come down. I guess they know which building has the loudest people behind it. Next I ask about the odd placement of all these stations in the middle of nowhere, beyond populations. I say it kind of looks like they’re built just for development opportunities. Mr Trudel explains that the CDPQInfra is not about development. They’re not building the line for development. I ask that surely there must be some benefit. He says, they will only sell development rights, and will get any additional real estate taxes from those developments. Oh, like Tax-Increment-Financing? He’s apparently never heard the term, and is concerned that the term may imply that taxes go up. He’s careful to point out that it doesn’t mean taxes go up, just that they will collect additional tax revenue due to developments near the line. Apparently they’re very careful to not appear like they will raise taxes. But apparently it’s been no concern to anybody he spoke to that the Caisse will basically collect real estate taxes as their profit, so these new developments won’t add to the city’s tax base. But the city still has to provide a bunch of other infrastructure besides just the transit connection. In effect it will shift money away from the city; and with it will shift power away from the city. He talks about several of the developments, mentions one near Fairview, another by Devimco right next to the dix30 station in Brossard. On that Note, I ask about the terminus, on the far side of the 30. As I understand it that area was supposed to be undevelopable, supposed to be agricultural, to prevent sprawl. He says they’re getting the area re-zoned, but they won’t develop there, they’ll use it for the parking of the trains. And to build a bus station, and to move the Chevrier parking lot there from Brossard. Apparently the city wants the parking to be moved away from the city. He’s not very categorical about it, so I’m not entirely convinced. What about using maintenance center that the AMT is building in Pointe-Sainte-Charles, can they use that? He says they’re looking into it. 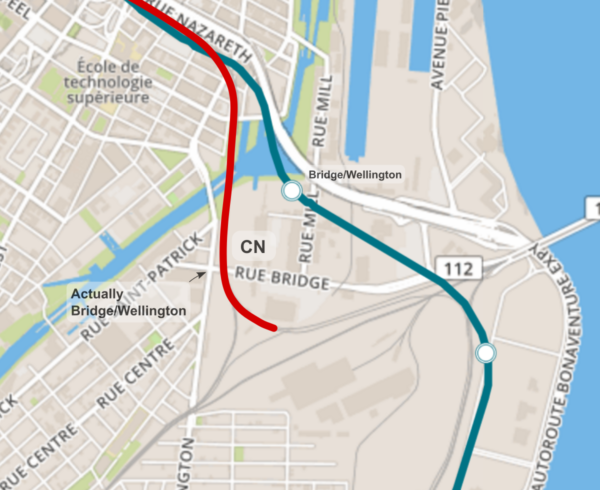 On that note I ask him why they are not using the existing rail line further south, but instead are building a ramp in downtown and tunnel under canal Lachine. He mentions they’ve been talking to the CN, the formerly public now private freight railroad company that owns the tracks and gare centrale. The CN offered them the use of the corridor, but apparently the Caisse could not make the connection work. Although the explanation doesn’t seem very satisfactory, because it seems they insist on building a tunnel in the area. Trudel says that CN even offered to sell that corridor to the Caisse, because it’s only used by passenger trains anyway. I’m incredulous, because I was under the impression that the public has been wanting to get it’s hand on this infrastructure for years, because the CN, the formerly public railroad, is charging the passenger railroads like the AMT lots of rent every year, and now they want to sell it to another private entity instead?! Trudel makes it clear that the Caisse is also public; but I’m not convinced. They’re not really under direct control of the government. I talk about how the privatization of the CN in the nineties was basically throwing away infrastructure, and the loss of control is still hurting the public — especially when wanting to run passenger rail. I’m concerned the same thing will happen again, now with the Caisse, where we’d loose control for example over the Mont-Royal tunnel and the Deux-Montagnes line, which the AMT finally acquired from CN just two years ago. Usually for a Public-Private Partnership, there will be a concession for some number of decades, and eventually the ownership will revert to the public. 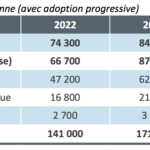 In case of the REM, the Caisse will keep owning the infrastructure. Being a former CN employee, Trudel has a different view, that the share-holders bought and paid for the CN fair and square (which isn’t really relevant, it was government’s mistake). He also says that there will be an option for the government to buy back the line at some point. I haven’t seen anything in any of the documentation about that, but I make a mental note check whether that’s true. I finally meet the guy who has a lot of technical knowledge. I looked him up later, he’s the director of operations of the CDPQInfra. He used to work for the Quebec City transit agency (RTC), and worked several years in Lyon, France for Keolis. He’s very French. Andlauer talks very precise and annunciates carefully. My questions center around the apparent lack of capacity, how the light metro doesn’t seem to be the right choice. He tells me about the choice to go for the LRT. He talks about automated metros in Lyon and Lille in France, how they reach 85 second headways, how this is the future and everybody is building automated systems. His choice for the system seems to be very much colored by this experience, like often I’m getting the impression that Quebec is too much looking to France and not realizing how things are done elsewhere. The systems he mentions for Lyon and Lille run in cities that are smaller than Montreal, and they don’t have any branches, and don’t rely on having a single station downtown where everybody will get off. When I worry that the capacity won’t be enough, he says he’s got a ridership study that tells him the REM will have 150K riders per day. But the Caisse won’t publish this study yet, maybe in fall, or early next year (maybe only after they secure the government funding). But it does seem that his study mostly pertains to the ridership coming from the branches of the line, and the transferees from the Mascouche line and St-Jerome line and the Blue line weren’t considered. I ask about all the other possible other extensions, he says the government gave them the mandate for three things: the airport, the West Island, and Brossard. Continuing on capacity, he points to Paris, where the metro is running at 90 second frequencies now. When I point out that this is a last resort, that running at these crazy frequencies is what you do when your physical infrastructure can’t keep up, and that you should have larger stations, he says that it is a waste to build large stations now, and that in twenty years, when we need the extract capacity, we should extend the platforms. I argue that this seems backwards, because extending platforms of a running system once it is in place will be very expensive. He says ‘no, this is exactly wrong’. He explains that it will be more cost efficient to extend platforms later, rather than waste money on over-dimensioned stations. He keeps going back to saying that the existing heavy rail stations are 300 meters long, and that’s ridiculous, and large stations like that are very expensive. But surely, there must be a compromise between the 80m toy train and the 300m monster? Speaking about the tunnel station at Edouard-Montpetit, he says the station ‘has to be built’. It is a very complicated station, he said it would be 80m underground. CDPQInfra would have included it in their proposal, but the studies weren’t done. They wanted to go public with their proposal now, so they included the line without those stations. The 5.5 billion cost does not include the potential stations, funding for those will be found later. It later occurred to me that maybe they wanted to get the proposal out before the public funding went to the Blue Line. I ask Andlauer whether they will shut down the whole line once they get funding for the Edouard-Montpetit station. He says that most likely they will put accommodations in the tunnel to be able to more easily add the stations later, like putting platforms. I ask him whether that means they’ll add a second tunnel for the length of the station. “Tunnel, what tunnel? There will be no second Tunnel.” I explain him the plan the AMT had, to build a second tunnel along the first one for the length of the station, and use each for a platform and a track. He is genuinely surprised, never heard of this plan and it sounds crazy to him. I ask him about safety in the Mont-Royal tunnel. It is 5km long, and has no emergency exit. Right now the AMT only allows one train per direction, so two trains in the tunnel. In case of emergency, no matter where along the tunnel there is an issue relative to the train, that means people will always have access to an exit without having to pass another train. Andlauer explains that AMT trains can have 2000 people each, so two trains would have 4000. He says that with the REM, they will allow six trains in the tunnel at once. Given that the REM trains will have a capacity of 600, this will result in 3600 people in the tunnel at once – less than today. I argue that sounds like a simplistic calculation, given that trains will block each other, and that egress will be difficult and emergency vehicles won’t have access. He counters that nowadays, you don’t use egress, you use containment. He says there will be caverns in regular intervals, in case of emergency people will go there and be safe for an hour, until the emergency is resolved. And then they can get rescued. There’s also the alternative idea of building a wall in the tunnel between the two tracks, which would basically create two tunnels – so there would always be one for egress. In any case, the Caisse will issue a tender to provide security in the tunnel, and it will be performance based. So the Caisse will basically just say ‘make the tunnel secure’, and it will be up to the creativity of the market to provide. I have many more questions, but at this point we’ve run out of time. Overall, I don’t know how to feel. Initially I was excited about this project, then as I delved deeper it didn’t add up. I got more and more suspicious as I realized the capacities seemed too low, the tunnel safety issue seemed completely ignored, and virtually all the confirmed new stations are along highways, some of them at locations where there are no people, and there will never be people. Then the issues with never letting the Mascouche line or the St-Jerome line into the tunnel, it all just seemed not to make any sense. Now that I have talked to some of the group, I’m more ambiguous again. They don’t seem to be nefarious, they seem genuinely excited. But so many questions remain. I sort of want to believe we have a great project. But there just so many issues. The lack of regional planning. Screwing over the people in Laval and Montreal East, who live along the St-Jerome line and the Mascouche line, which both should become branches to a new line going through the Mount-Royal tunnel. The REM is essentially taking one of the crown jewels of infrastructure from public control and kicking out all other lines, and trying to dump those extra riders on the full Orange Line. Then there’s the question mark around all the other commuter rail lines, and to what extend that very flawed, but existing network will shut down, rather than be improved. Then there are the weird locations of stations downtown, placing them nowhere, essentially depriving people who live or work in the old port, Pointe-Sainte-Charles and Griffintown, to get better access to transit. There’s the anti-urbanism with stations along highways, almost all of them. 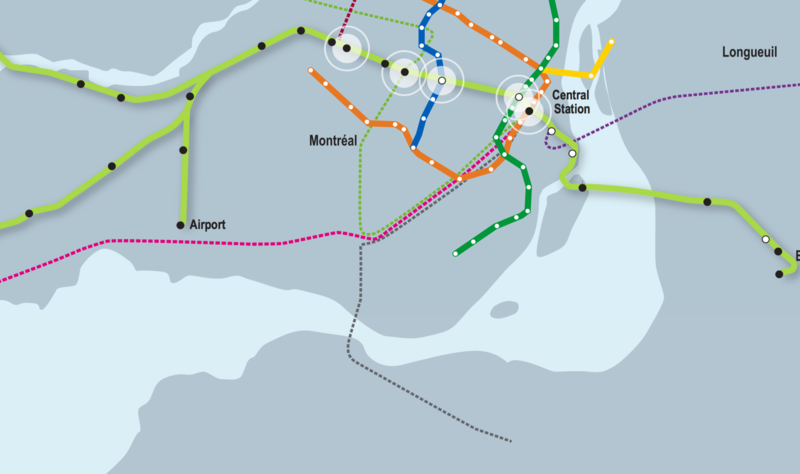 The uncertainty around the very important McGill and Edouard-Montpetit stations. 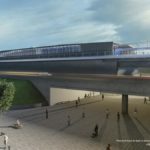 And more potential issues: the claim that the Deux-Montagnes line won’t have to be shut down to build the automated line, rebuild all the stations, build all the 13 grade separations, to make preparations for the tunnel stations, and also to build security measures in the tunnel (shutdowns ‘maybe a weekend or two’). The cost of the airport spur relative to ridership (maybe 800M$? Vs 10K riders). The cost of the West Island spur relative to ridership (16km, half elevated vs 11K riders). The optimism around the ridership to the airport, contrasting the lack of considering riders coming in from the proposed transfer stations. Then when it comes to capacity on the line. The planning of crazy frequencies first, 90s frequencies on a heavily branched line. The uncertainty around safety in the tunnel. The strange financing model, involving the Caisse taking in incremental real estate taxes, direct public funding, and fares. And those fares are unknown, and the share of revenues between bus/metro operators and the Caisse is unknown. And unlike other public/private partnerships, with this one the private partner will actually own the infrastructure indefinitely. Yet again we’re giving away the control of infrastructure to a private entity, which turned out to be a huge mistake when selling the infrastructure of the CN in the 90ies. The real estate development questions. Building stations so far out beyond developed areas, which looks like an invitation to build sprawl. The contradiction in the Caisse’s assurance that they don’t do this for development, but the incentives with selling development rights and collecting tax-increment-financing pointing the other way. It appear their assurance just means they won’t actually develop suburban mega-developments themselves, they’ll just collect profit and taxes from it. The rushed process, where between announcement to the public and tenders and funding and start of construction there will be months; having worked in secret so long, apparently without much consultation of the involved stake-holders, in particular the city of Montreal (although with the current governance, who knows whether that would actually help). And overall, the lack of a regional plan. The line would maybe work well if the whole of Montreal only had a transit checklist of three items (airport, Brossard, West Island) and those 150K riders they represent. But we have millions of trips across the region, and hundreds of thousands of underserved people, and hundreds of thousands more who drive today and may want to take transit. Is this the best way? There could be a way of “saving” the Mascouche line. When Vancouver built the Skytrain™, they used the old CPR tunnel under the downtown area. 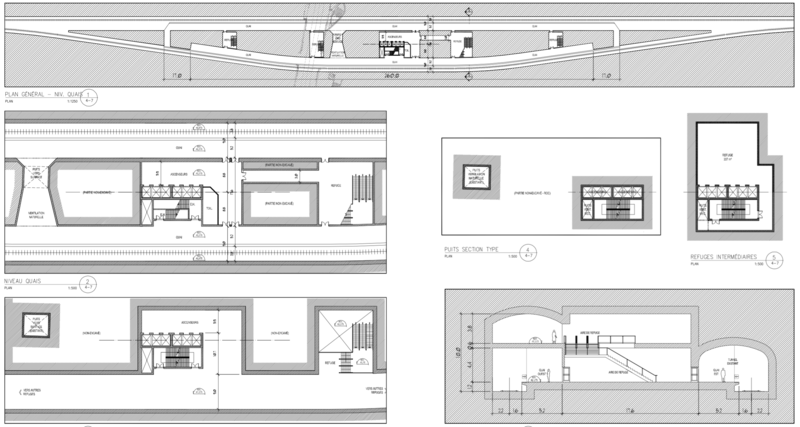 Since the ICTS rolling stock is very tiny, they simply doubled the tunnel by building a floor between the top and bottom half. This would help safety by effectively making two tunnels (they are already split in half at both ends, anyway). One could conceivably do the same thing with the Mont-Royal tunnel, by splitting the west track in two levels to run the toy trains, while keeping the east track mainline-sized to run commuter trains. It would be single track, yes, but as the Mascouche line has light traffic, it is certainly not a difficult thing to do. 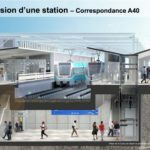 And this would make building the Édouard-Montpetit station much easier, as all there would be needed is widening the tunnel along the platforms. Maybe that could work. But We want to bring in the St-Jerome line to the tunnel as well. And maybe we want to have shorter branches along those lines going to maybe Laval and Anjou, respectively, where we want service say every fifteen minutes. If we kept the whole system compatible with each other, that would be possible. Maybe we’d need FRA waivers like Caltrain did in California, to run lighter European-style rolling stock on the branches that will be EMU only. But it would take longer and more complicated planning, and a regional view. I met Denis pretty early on, and was able to listen to him talk for over 2 hours. Got a bunch of questions in as well. I have more info on some of your questions. didn’t hear the whole plan, but the idea is to phase in the line so deux montage can run almost continually. He claims service reduction during off peak hours, plus some weekends should be sufficient. They will also be able to keep all existing stations active while they build new ones. He noted that 80m stations is key to making that happen. He also confirmed that every station will be engineered to expand to 160m. The said their studies predict that 600 person trains and higher frequency will be capable of handling capacity until 2040. Mount Royal Tunnel fire safety: Another person asked him about the fire safety issue. This citizen seemed to be an engineer of some kind, since he knew the number of the law and smiled with recognition about the fine print. The plan to build bunkers every 750m, which is apparently accepted practice and it was what AMT was going to do anyways even before the REM happened. In fact one reason Mcgill and Edouard are delayed is that AMT was doing work on starting the fire safety stuff already. Point St Charles tunnel: Denis said that the tunnel project will be one of the most technically difficult and expensive parts of the project, if there is risk of delays, it’ll probably be here. The area is extremely contaminated. I didn’t ask about the CN option, but I have to imagine, if they could have saved themselves the trouble, wouldn’t they have done it? He noted 14 grade crossings along Deux montagne. both overpass and underpass solutions are being considered. the TIF. Denis said “it would be nice to have” but that they figure they would get around $120 million out of it, which is a pittance and does not inform their planning priorities. No mention of development rights, but the feel I got was that they were focused of building the biggest line they could with the most users. I agree with your opinion on park and rides, though one line he had that made me more amenable was that they want every station to be designed for buses first, cars second. If true it should help mitigate the location slightly. The initial plan for the Rive Sud station was to curve north of the 10, next to the Brossard Eco-centre. But turns out its heavily contaminated so they curved south instead. No pedestrian connection to dix-30 is planned at the moment, though the Rome overpass (which has a sidewalk and bi-directional protected bike path) would provide a roundabout connection. FYI something like 80% of the remaining agricultural space left in Brossard has been purchased by the city and will remain protected. The station is on a narrow strip of developable land. He confirmed to me as well that no additional development is planned there. Anyways. That’s all the facts I can add to your write up. Great job. I largely agree with your concerns about overall planning and cooperation. They basically came up with the idea late last year when they realized Trucot would be unusable until 2022, and have gone full speed since. Though apparently they have been meeting regularly with STM and AMT people since October, which gives me some hope. Plenty of consultations over the next 9 months. I hope we can get clarity on all the issues. PS: what did the angry citizen you interrupted you rant about? I have not heard much irrational hatred for the Project yet. I’m curious. Thanks Faiz Imam, nice recap ! I actually only took very sparse notes, I reconstructed the information from them and from memory once I got home. Also some external resources; I found the people I talked to on linkedin. The venting citizen wasn’t being irrational, just kind of incomprehensible. I think his point was about how this is not going to work, the conversion from heavy to light rail, and all the problems related to that. I don’t see how it will be possible to convert the Deux-Montagnes line to REM without lengthy interruptions. The REM will use 1500kv electrification, whereas the Deux-Montagnes line is using 25kV 60Hz AC electrification. Both are incompatible. As would also be the signalling system (the REM is likely going to use CBTC). The underpasses/overpasses required to close the grade crossings will have to be built in urban areas where it will be impossible to build temporary deviation tracks (as CN did at Jct de l’Est in 2010). Anyway, the fundamental problem with the Caisse’s REM is the poor choice of technology. Light rail not only offers insufficient capacity, it also is radically incompatible with the existing rail network, and prevents proper integration with the current, and any future service. The loss of interoperability in the tunnel will force AMT to write-down billions of public investments in commuter rail assets that are less than halfway through their useful service life, and will drain the life out of the remaining services. And it will prevent VIA Rail from using the tunnel to reach Trois-Rivières and Québec, forcing VIA to keep running on CN’s congested South shore main line. Using a higher-capacity heavy rail technology similar to the London Overground or the Australian urban rail systems in Brisbane, Sydney or Melbourne could preserve interoperability in the tunnel. Higher capacity per train means that the headway could be kept around 6 minutes, which would give ample opportunity to insert a VIA or AMT train between an REM train. That’s what World-class cities do: they invest in their heavy rail system. Btw, anyone asked Denis Andlauer how he planned to force 2000 riders off an AMT Mascouche Train at A40 station and pack them in a 600-riders REM train already full of riders from the West Island? After having invested (some would say wasted) 670M$ on this line, this is rather insulting. How come mayors of Mascouche, Terrebonne, Repentigny and Pointe aux Trembles have not publicly expressed their outrage over such outcome? Their train will get simply killed after less than a decade of operation. Talk about efficient use of taxpayers money. I hadn’t even noticed that they are going to revert electrification to 1.5kv dc. They actually spent hundreds of millions on re-electrifying the line to 25kv ac in the 90s, when the MR-90 trains were introduced. @Jean-François: I went to tonight’s meeting thanks to Anton. I did not ask this question directly to Denis Andlauer but I did talk about it to another member of the team whose name I didn’t get. He said they can have 3 empty REM trains waiting for the Mascouche train at the A40 station, and they can design the station in a way that the transfer is on the same platform. Schedule: this will result in a pretty messy schedule. It might work in the beginning, when you don’t actually need high frequency to service the 3 branches properly. But as soon as the branches will need higher frequencies, it will not be possible to leave gaps in these branches’ schedules to be able to insert these special trains. Fights: if the transfer really is on the same platform, it will be pretty funny to see people fight to be in the Mascouche train cars that will arrive in front of the first REM train to leave. And the fights on the platform between the people who lost their first fight and will still try to get in this first train. Of course the third train will only leave 3 minutes after the first one, which is not so long, but waiting for 3 minute and seeing two other trains that you could have taken leave during this time is pretty frustrating. Especially when it happens every morning. And it will: the system is designed like that. Also, people who lose their fight in the morning will just have to wait 90 or 180 seconds for the next train. No big deal. But in the evening ? Until the Edouard-Montpetit and McGill stations are built, we can assume pretty much every user of the Mascouche line will travel back from Gare Centrale to A40 on the REM. And since the REM will be so reliable, they will all want to take the latest possible REM that will make it to A40 on time for them to take their train. The evening peak hour is usually more spread that the morning, and people have different risk tolerance, so this would probably not be such a big issue, but it’s another example of how it doesn’t make sense to cut a heavy rail line in the middle of nowhere, and expect everybody to continue their trip on a light rail line. So in conclusion, this reinforces the impression that they were given the mandate of creating a profitable project that would take care of the airport, the south shore and the west Island, and that they didn’t have to worry about the overall regional planning. And they came up with this, which makes sense given the mandate, and now they are just trying to make it seem like it makes sense for the whole region, but it’s just not true. But it’s not really the CDPQ that we should blame for that, it’s the government who gave them this mandate, and who is nowhere to be seen now to explain what’s supposed to happen with the rest of the region. And this is the part that is really really scary. How will the governments decide if they fund this project or not ? Is this part of a bigger plan ? Is this investment going to be compared with other investment opportunities ? On what basis ? When ? The governments probably have that but it would be very interesting to know how the decisions are made and who decides the schedule.